If you are in a position to make a significant contribution, perhaps you would like to sponsor a whole KickStart Ghana project? This might involve sponsoring one of the football teams we work with for a year, helping renovate a classroom or sponsoring someone to go on to further education. KickStart Ghana will keep you involved at every step of the way and you will certainly see tangible results from your donation. We understand that if you considering making a significant donation you will have many questions. Please contact us to arrange a mutually convenient time to meet to discuss your potential contribution. A regular donation will help us to keep our projects running. £5 a month will help provide educational resources for local schools. £10 a month will pay for two classrooms to be repainted each year. £20 a month will provide a new pair of football boots for a Dynamo FC team. 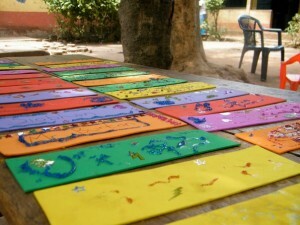 A single donation will immediately help with our projects in Ghana. A few pounds can make a big difference to our work in the community.